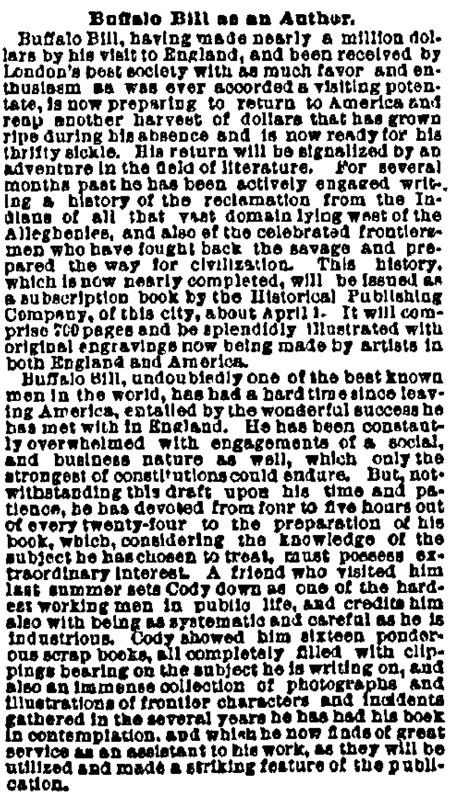 Buffalo Bill as an Author. Buffalo Bill, having made nearly a million dollars by his visit to England, and been received by London's best society with as much favor and enthusiasm as was ever accorded a visiting potentate, is now preparing to return to America and reap another harvest of dollars that has grown ripe during his absence and is now ready for his thrifty sickle. His return will be signalized by an adventure in the field of literature. For several months past he has been actively engaged writing a history of the reclamation from the Indians of all that vast domain lying west of the Alleghenies, and also of the celebrated frontiersmen who have fought back the savage and prepared the way for civilization. This history, which is now nearly completed, will be issued as a subscription book by the Historical Publishing Company, of this city, about April 1. It will comprise 700 pages and be splendidly illustrated with original engravings now being made by artists in both England and America. Buffalo Bill, undoubtedly one of the best known men in the world, has had a hard time since leaving America, entailed by the wonderful success he has met with in England. He has been constantly overwhelmed with engagements of a social, and business nature as well, which only the strongest of constitutions could endure. But, notwithstanding this draft upon his time and patience, he has devoted from four to five hours out of every twenty-four to the preparation of his book, which, considering the knowledge of the subject he has chosen to treat, must possess extraordinary interest. A friend who visited him last summer sets Cody down as one of the hardest working men in public life, and credits him also with being as systematic and careful as he is industrious. Cody showed him sixteen ponderous scrap books, all completely filled with clippings bearing on the subject he is writing on, and also an immense collection of photographs and illustrations of frontier characters and incidents gathered in the several years he has had his book in contemplation, and which he now finds of great service as an assistant to his work, as they will be utilized and made a striking feature of the publication.